Our house has been on the market for over 3 weeks now. I clean and tidy up each morning, and force the children to, as well, so we can be ready if we get a call that they want to show it that same day. On the days that we do have showings, we have to go somewhere else until they are done looking. The most memorable day, last Thursday, the people stayed for 2-1/2 hours. 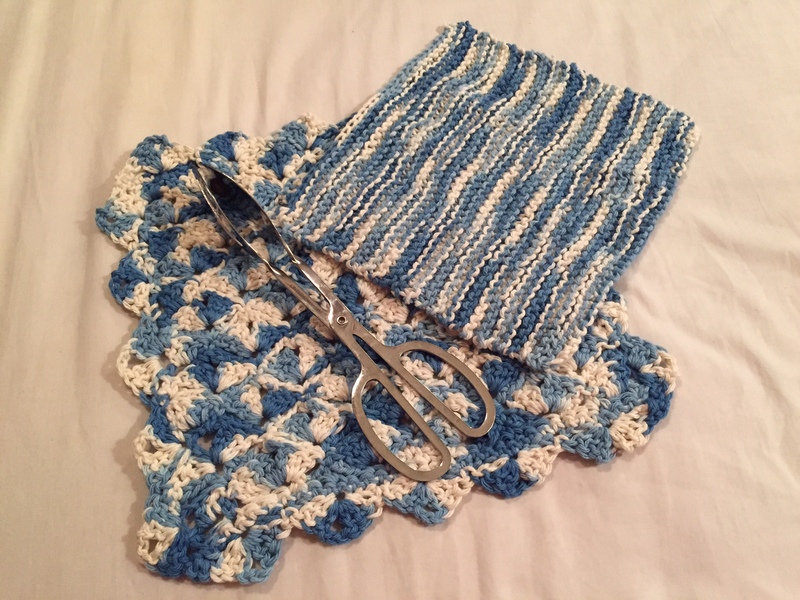 So, while I waited last Thursday, I worked on a crocheted dish cloth, the one on the bottom, in this picture. The knitted one was in progress and I finished it while I was camping the last time. I have a large spool of variegated cotton thread, and used it for both dishcloths. There is still enough on the spool to make at least another cloth. I do not know how to knit well, and didn’t use a pattern for this cloth. I just used the garter stitch and went back and forth until it was a good size. I do not know how to do harder stitches. The other one was from a booklet put out by the Lily yarn company. I had to concentrate to figure out the pattern, as I am not a very experienced crocheter. I can, however, follow a pattern better when it comes to crochet then knit, so I figured it out. Now, I plan to make another one from this pattern soon, so I don’t forget. The only other time I ever made it was so long ago, I had forgotten, so I don’t want that to happen again. I was pleased with these cloths, and will probably add them to my gift stash. I think they are very pretty- hope your house sells soon!